Equipment and carts of supplies line the hallways, are stuffed into rooms that were built to be offices, or are banished to storerooms that are far from the OR. Preoperative nurses struggling with too few spaces for patient prep sometimes and bottlenecks in the PACU at others. 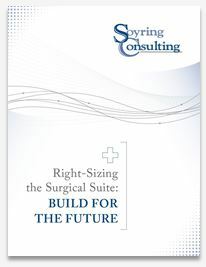 Download our latest white paper, Right-sizing the Surgical Suite, to learn practical tips for improving the design of your OR suite for better efficiency. Download today to improve staff efficiency and physician satisfaction! Soyring Consulting provides clinical and managerial consulting services to healthcare facilities of all sizes, including For-profit, Not-for-profit, Community, University, and Faith-based facilities and systems. Our team has worked in more than 35 states across the United States in all areas, including surgical services, sterile processing, hospital and facility design, nursing/clinical units, and others. By combining our experience, proven knowledge, and time-tested skills, we work with your team to create targeted opportunities, along with the plan and achievable goals to get to them.